I enjoy is going to my home town in Upstate South Carolina. I was born in Greenville and grew-up there in a loving family. The first 22 years of my life were spent there, getting my education from first grade through a diploma school for nurses. My husband and I met there too. Greenville is at the foot of the Great Smoky Mountains. My family thought nothing of driving an hour on Saturdays to the beautiful mountains, where parks, scenery, fall leaves and amazing views could be enjoyed. You can see why I would get excited when I go visit Upstate SC and see those great mountains in the distance. Over the years I have taken many pictures of my Upstate home and surrounding areas. These are pictures of some of my favorite places to go while I visit family there. 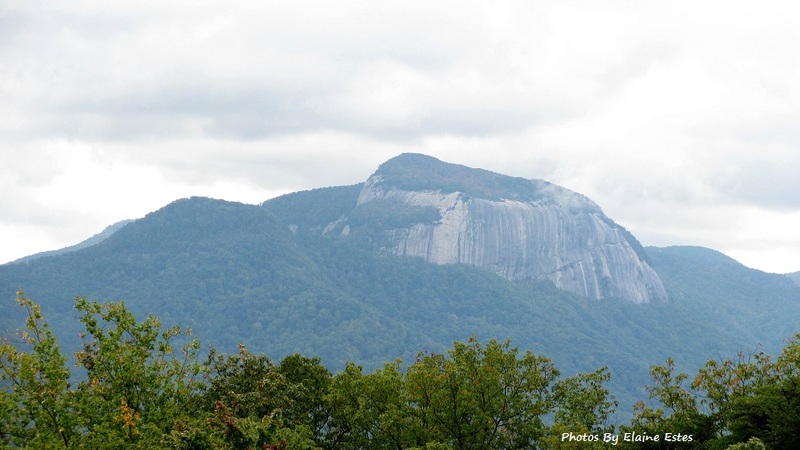 The mountains my family visited include a South Carolina mountain Table Rock; a granite protrusion that stands 4100 feet at its highest point. 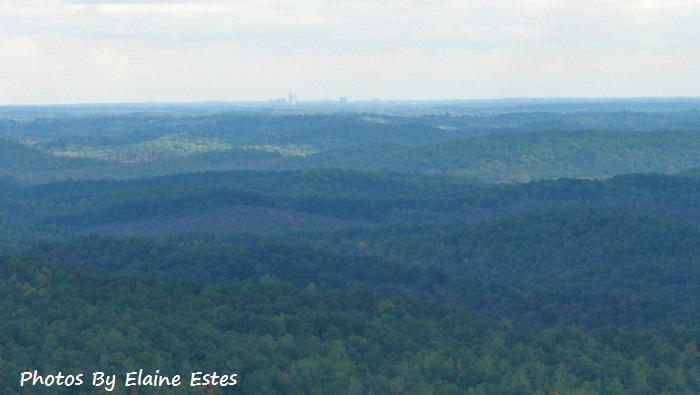 It can be seen from The Mountain Bridge and Wilderness Recreation Area of South Carolina. Table Rock, SC as seen from SC. Next is a photo of the outline of Greenville as seen from the same site. Although I have lived in other states, Louisiana, Mississippi, and now North Carolina, I always love to go back to Upstate South Carolina where now all that is left of my family still living there is my brother and his family. I live about a 5 hour drive away, but about every 1-2 months I go back to my home town. I am proud of the changes made in Upstate SC, more specifically Greenville, over the last 40 years. Originally it was Cherokee land later obtained Richard Pearis fter he had a son by a Cherokee woman before the Revolutionary War. After the war he was run off because he sided with the British. His buildings and grist mill were destroyed and his land divided amongst patriots from the war. Enough history, except to say that at one time Greenville claimed to be the Textile Center of the South. I lived there from 1951-1973. The changes started taking place in 1966. Now look at these photos of the new and improved store fronts, shaded downtown Main Street with European-type sidewalk tables in front of restaurants. 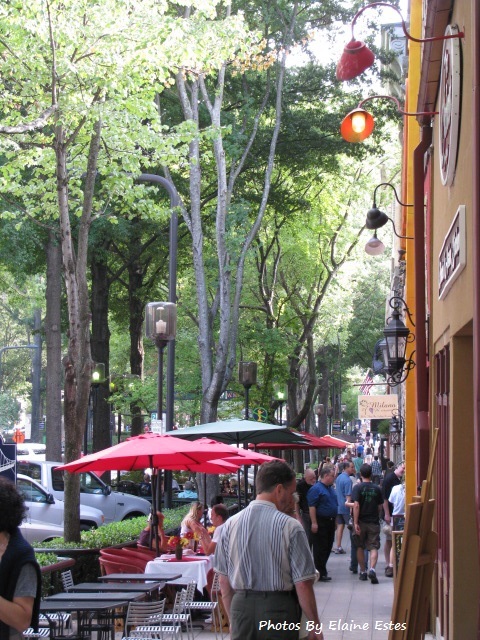 Downtown Greenville’s tree shaded Main Street. I remember the Reedy River as the place where dead branches, dead trees, and trash ended up at the waterfall. It was contaminated by the local mills too. To me the biggest change has been to the Reedy River Falls which now is a park. 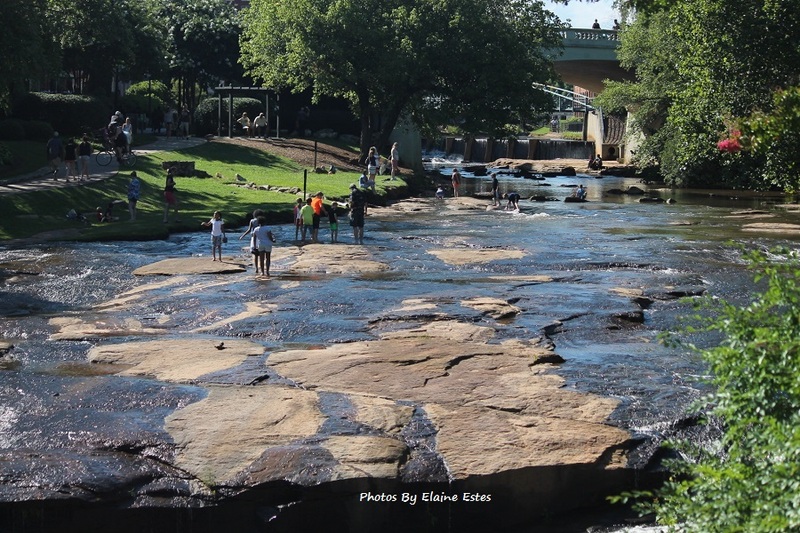 The waterfalls, suspension bridge and rocks on which you can walk on or stand on in the stream of the Reedy River is now a place where wedding pictures are taken; where families go out on the rocks and splash in the shallow waters. The Liberty Bridge was built slightly downstream and across from the biggest waterfall of several. There are lush gardens, sandy beach areas, green trees providing shaded sites of relaxation where one can enjoy the beauty and activity of nature. 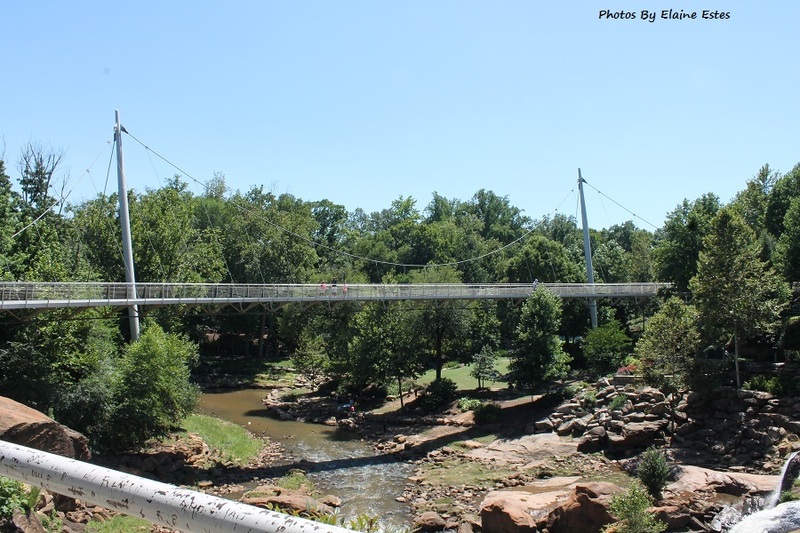 Scenes from the Reedy River Suspension Bridge. Looking up river from the water fall by the bridge. Bridge over the Reedy River is 344 feet long. 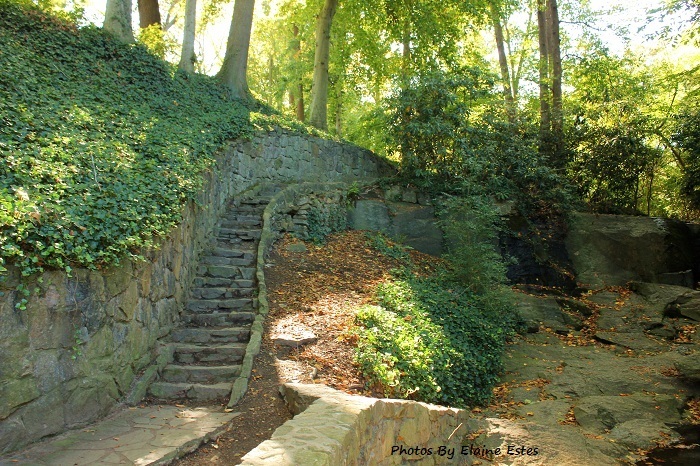 Shady paths can be seen around the Reedy River Falls Park. 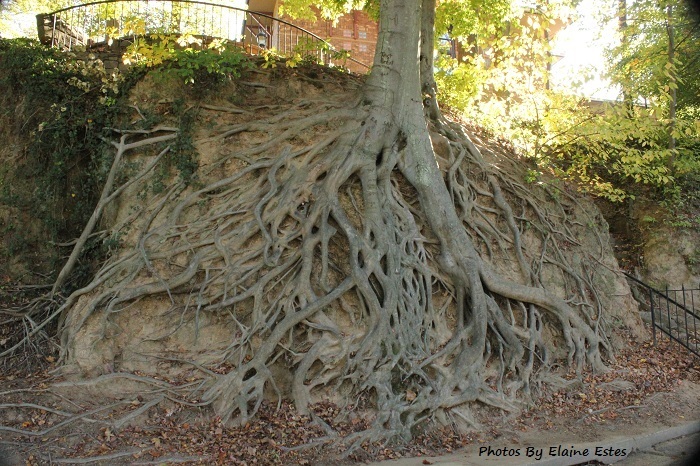 Greenville’s Root Tree is said to be a 70 year old Beech tree. Greenville has so much history, a very active Arts group and all kinds of stores just downtown, not to mention many suburbs with their own shopping squares. With so many beautiful sights to see, history to explore, mountains to drive in and shopping to do I would highly recommend a week long trip to explore the Upstate of South Carolina. Before I moved to Los Angeles 25 years ago I lived on the other side of the Smokies near Knoxville, TN. Love that part of the country and go back at least once a year since I still have siblings living there. I’d like to move back someday. I’ve been to Greenville a number of times. Played shows there when I was touring with a stage show and when I was a teen played the Shrine Circus at an old baseball field with my family’s juggling act. Don’t recall much about the town as we were usually just there for a show and gone after we were done. Do you miss the mountains too? Tenn. Is a gorgeous state too. Thanks for your comments!! I too live at the foot of the Smokey Mountains, (Appalachian Trail) but on the Tennessee side. I love the mountains. My husband and I have enjoyed the mountains from the North Carolina, Virginia and Tennessee side. We have only passed through the Georgia and South Carolina sides. Your writing makes me want to experience it from your hometown view! Wow! We have a lot of similar loves. A large part of my life was within view of those mountains, but from the South Carolina side. The blog I wrote about the blizzard of 92(?) took place in Columbia, NC near Tryon, 20-30 miles south of Asheville. I will always love the mountains! In fact you just inspired me!! I must write about my childhood trips with my family to Asheville and Brevard!! Thank you!! I am recovering from laporascopic surgery and plan to do more reading of my fellow bloggers. Looking forward to yours too! Beautiful photos, I would have enjoyed living in Upstate South Carolina also. Thank you. I am so proud of the vast improvements they made. 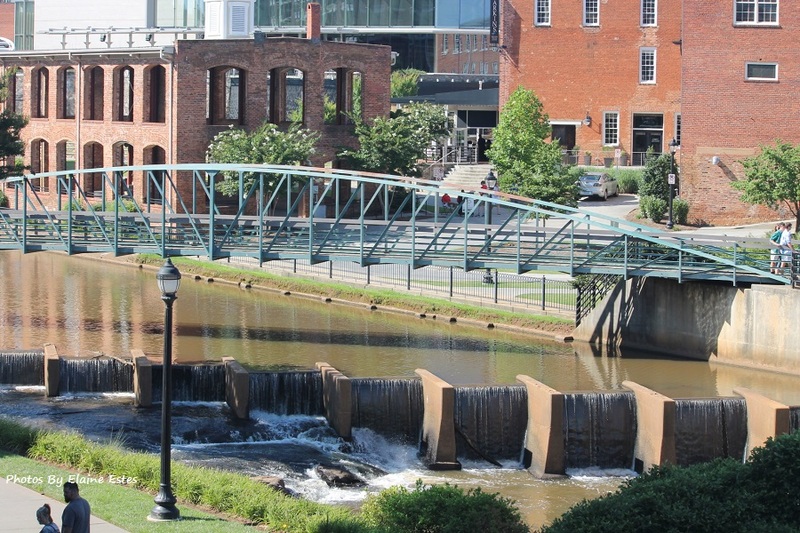 Great story and pictures of Greenville! We live in Greenville now and absolutely love it. A beautiful city surrounded by beautiful landscape. Thank you!! I haven’t lived there in over 39 years but it makes me appreciate the progress and its appearance even more when I come for a visit. So glad you like the blogpost!! It looks very quaint, and I love the shady paths! Thank you, I am so proud of my home city. My dad is from Greenville and I lived there until I was in 9th grade! My brother still lives there. My dad’s office is there, but he recently sold his house and moved to Seneca. Our house was in the Augusta Road area. It is a great place and we love to visit. Next time you go there let me know. It would be nice to meet you. Yes, I am/was familiar with Augusta Road. Where did you go to school? Thank you for commenting! Where about does your brother live. I lived between the old General Hospital and St. Francis hospital on Arlington Ave. Then we lived near the old Welcome elementary School. Then we lived behind where Pete’s was on Wade Hampton Blvd. It’s a small world!! Absolutely! Would love to meet you too! My brother was born at Greenville General! He lives on Otis Street-off of Augusta. He completely renovated a condemned house. It’s beautiful. He has a renovations company called Galt. My dad has had Narramore Architects since 1973. I went to Augusta Circle Elementary, Hughes Middle, and Greenville High for one semester-then my mom remarried and we moved to Madison, GA. When we grew up, my brother moved back. I’ve always thought of Greenville as one of my homes. I was born at Greenville General too. I will try to contact you when I go there again. It will be about one or two more months. Are you on Facebook? I am on as Elaine Estes. Going there now. See you someday in the not too distant future. Left you a hello on Facebook messenger. Thank you for sharing my post! Glad you liked it! !